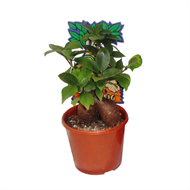 These popular plants come in a range of sizes, varieties and pot colours which will vary according to availability and price. Actual item may differ from image shown. This ficus tree will naturally grow to 15 metres. By keeping them in a pot and constantly trimming them, they can be kept as bonsai trees. They are very adaptable to most soils and conditions and will thrive for many years kept as a bonsai plant. Will tolerate full sun or semi shade, and should be fed every three months with a slow release fertiliser.